Fast forward 10 months and I was stood on the start line of the South Downs Way 100 miler. The days before the race had been those English summer days you dream of - perfect for paddling pools, picnics and barbecues; not so ideal for running, especially for someone who struggles in the heat. But my rain dances worked - there were huge storms the night before the race and then the rain gradually eased as we got closer to 6am and the start. From a logistics point of view everything about the race was like clockwork thanks to the experience and attention to detail of the Centurion team and their army of volunteers. 6am on the dot we started with a gentle trot around Chilcomb Sports Ground before heading onto the South Downs Way which would take us all the way from Winchester to Eastbourne. I loved the fact that I was running something that even looked significant on our road atlas! I'd decided to split the race into four as I thought this would help psychologically. I'd treat each section as a separate race - I'd make some sort of significant change between sections and use this to refocus and start again. The first section was the 23 miles to Queen Elizabeth Country Park where there was a significant feed station and I'd see Brett for the first time. This section was just about taking it easy and getting into the swing of things. Then I'd plug in my MP3 player for the next section - QECP through to the "halfway" point in Washington where I'd see my whole support crew and my brother, Barney, would start pacing me. I'd probably change my top layer of kit at that point to put on something warm and dry for the night section. I'd also stop listening to music and focus on chatting to Barney / catching up. The final quarter was "the big unknown" - mile 77 onwards. I'd swap pacers (with Brett taking over) and would probably put my music back in again. Section 1 went well. The main issue was mud. Last time I'd run this section was during all the flooding back in February - it had been really hard going that day but I'd expected it to have all dried out. The rain the night before probably hadn't helped. The mud at this point is clay based so it was really sticky and slippery and it was impossible to keep my feet dry - not ideal so early on! Luckily I was carrying a spare pair of socks and so Brett helped me change them at QECP. After that the course was much drier. I left the QECP checkpoint at 10.30 so was on planned pace. My stomach started to feel slightly uncomfortable as I headed up onto Harting Down so I decided to have an Immodium - unfortunately this was probably a bit too late and I should probably have taken a preemptive one at the start. I had to pop into the bushes at several points which started to slow me down. Anyhow section 2 went pretty much to plan. I kept chipping away at a good solid pace, helped by listening to music. Brett and my parents popped up to cheer me on at several points which was great - I'd been worried about how I'd feel on this section given it was already ultra territory but I still had over half the race to go. I hit 50 miles in 11 hours so was really pleased with that. I was feeling pretty good at Washington. I changed my socks again, had some pasta and a cup of tea. I left the checkpoint at 12 hours. The first sign that I was getting tired was when Barney and I made it 200m out of the feed station and I realised I'd not picked up any new bars - I carry enough so that I can eat one an hour between feed stations. Barney began his role as pacer admirably by going back to collect them for me while I kept on plugging up the hill. It was lovely having company and catching up on the week. Barney hadn't run on the course before and he was really impressed especially as we were treated to a cracking sunset. We were now into the section which I knew well - I'd run it during the SDW50 and had also been out to recce it another 3/4 times as I'd wanted to make sure I knew the section I'd be doing in the dark really well. I didn't want to risk getting lost but also knew it would help psychologically to know where I was going. I'd also done the earlier bits of the course once and had been pleased at how well I'd remembered them. It had helped me feel so much more confident going into the race, knowing exactly what was coming up and being able to run through the various sections in my mind. I'd definitely want to do the same again if I were to do another big ultra, especially one with a night section. I kept up my detours into the bushes throughout the third leg. I was drinking straight coke by now as I was struggling to swallow solid food. I pretty much stopped eating the bars I was carrying and focused on drinking between feed stations and then eating what I could at the feed stations - a couple of potatoes, plain macaroni, jelly babies. I definitely wasn't getting enough down me though. In future I think I'd try some shot blocks as they're high in calories but I could basically have just sucked on them. My pace gradually slowed during this section. To an extent this was probably due to it getting dark - though I don't generally find that has a huge impact and my LED Lenser head torch was great. I think it was mostly cos of build up in fatigue and lack of energy. That said I was still running the flats and downhills and feeling positive. But when we came into Housedean feed station (77 miles) it was just after midnight so I knew I'd slowed down and also that a sub-24 hour finish was now highly unlikely. Housedean was where Barney stepped aside and Brett joined me. Brett definitely drew the short straw! I changed my top / sports bra so that I'd be dry for this last colder section. And I also put my windproof jacket in my rucksack. In retrospect I should have put in a merino base layer just in case. And should probably have changed from shorts to leggings. I had some more of my mum's pasta at this point and a cup of strong black tea. The next section was when the wheels started to fall off. The course was very exposed and I started to get cold. I was still running bits and bobs but progress had definitely slowed - my muscles would ache from the impact of running. We decided that I'd put on my windproof jacket at Southease and also plug in my MP3 again. Stopping to do both of these things (even if it was only for about 5 mins) meant I got very cold (shivering, teeth chattering) and my leg muscles completely seized up. It was really hard getting going again as my legs just didn't want to function. The last 15 miles weren't pretty. We walked rather than ran and there were times when the walking pace was painfully slow - notably the long climb out of Alfriston. I got very cold and put on all the clothes I had to keep even vaguely warm. I learnt not to stop moving at the feed stations. I'd keep marching on the spot just to prevent my legs from seizing. The route diversion after Alfriston was cruel as it involved getting over three stiles! Otherwise the SDW route is great as it involves gates rather than stiles and so no awkward muscle movements. The feed station crew at Jevington were great - the feed station is in a church hall at the top of some steps. They took my bottle to refill so that I could just stay in the road and keep moving. Mile 96 - digging deep! I was really pleased I'd done the SDW50 and so knew the route through Eastbourne to the finish - it made it seem much shorter than it had the first time around. Anyhow, it was wonderful when the entrance to the sports ground came into view. My parents came out to greet me and Barney was stood just inside the ground. The final 400m were a "victory lap" around the running track. I had the track to myself and walked it slowly and purposefully as I was cheered on by everyone at the finish. I was really looking forward to being able to stop - but I also enjoyed savoring this last section on my own without listening to music. And so I finished my first 100 miler in 26 hours 5 mins. There are definitely lessons to be learned but overall I'm pleased with how it went. I didn't pick up any niggles which completely surprised me. Yes my legs have ached and I've had some blisters to deal with. But in general my recovery has been good. I'd like to say a massive thank you to the Centurion team and to all the volunteers who made the event possible. The SDW100 was brilliantly organised from pre-registration post-finish. This was my first 100 miler and the great work of everyone involved has created some memories / stories which will be with me forever - whether I go on to do many more 100s or whether this is my one and only. I'd also like to say a huge thanks to my support crew (my parents - Jane Miller and Gordon Miller) and my pacers (Barney Miller and Brett Keartland). Also to Brett for making so many of the recce runs possible by being my own personal South Downs Way taxi driver. 8 months ago I was sat in front of my computer planning out my 2014 race season - that would lead up to my first ever 100 miler. After reviewing my 2013 season I decided to do fewer long training runs and to do my two longest runs as races - so I entered two 50 milers, one 10 weeks out, one 6 weeks out. The first was the South Downs Way 50 and I had a surprisingly good race. But by the end I had a niggle in my right knee. And I had the usual fatigue you'd expect after a race that length. So 4 weeks later I wasn't convinced that doing another 50 miler was the best idea. I hadn't managed to do consistent training since the previous one (cos of fatigue and my knee), was worried about doing further damage to my knee and realised that further fatigue could mean no decent training block before the 100. This was all useful learning and meant I went into the Malvern Hills ultra (my second scheduled 50 miler) feeling pretty certain that I'd stop at around halfway. My main concern was that I'd get caught up in the excitement of the race and that that (plus a bit of ego) would see me carrying on to the end and then regretting it the next day. The race start was one of my all time favourites. Based at Holt Castle, we were greeted by suits of armour before heading through to register in an oak panelled room with tapestries hanging on the walls and an old stone floor which looked like it could tell a few stories. The best bit was that the women were invited to use the upstairs bathrooms rather than queue with the men - the view across the gardens from the loo was at the polar opposite end of the spectrum to the usual pre-race portaloo experience! It was a beautiful day to be running and the course lived up to my expectations in terms of scenery. It felt like we were there on the perfect weekend of the year - when we weren't running through carpets of bluebells (at the point where they were almost luminous) we were running through pear orchards in full blossom. The route is self-navigated but we hooked up with some locals for the first bit until we hit the Worcestershire way. Then it was just about "following the pear" which is symbol for the area cos it's the only place the black pear grows and so was the long distance footpath symbol. One thing that really stood out about this race was the friendliness of the other runners. It's something I always enjoy about ultras but this felt different. Most people had run the race before and were running with friends, enjoying it as a social day out. My knee was surprisingly ok. I had a bit of tenderness in the first 8 miles but that went away which was pleasing. The acupuncture and massage seemed to have paid off. In addition, my fatigue levels were considerably better than the previous weekend when I'd struggled to cover 10k at a run/walk. I focused on staying at a comfortable pace and enjoying myself. It was good to see my parents and Brett up on the Worcestershire Beacon - because I wasn't pressurising myself to race I stopped and had a nice chat, which I wouldn't normally do. The race was an out-and-back - when I got to the feed station at halfway I pulled out. I was still feeling ok but knew that this was the sensible option - completing the full 50 would involve me taking myself into a very dark hole and this wasn't the race where I wanted to do this - I've got bigger fish to fry. I was pleased I'd made the call to DNF before the race rather than during it. I made the decision objectively - it was the sensible decision based on how I was feeling and my current training. That meant it felt different to making the decision mid-race when the decision would have been clouded by how I was feeling at that particular time. This was definitely the right call. Brett wasn't racing and we enjoyed time exploring Malvern / going for tea. I then recovered quickly - I was running again on the Monday and covered 70 miles the following week. I've managed a really solid 3 week training block since the event and that's definitely what I need to be doing for the 100. Now for the taper! I’m doing the South Downs Way 100 in June so doing the 50 miler seemed like a bit of a no brainer, especially since it’s on the second half of the 100 route – i.e. the bit I’ll need to do at night in a couple of months time. Until about a month before the race, training had been going pretty consistently and I was pleased. Learning from last year, I’d decided to focus on consistency rather than volume – from October to December I didn’t run more than 15 miles but I ran little and often. My lower leg injury from last year hadn’t shown any signs of reoccurrence so I started to up the mileage in January. I gradually increased mileage to the point where I was doing 50-70 miles a week. I also did several long runs of between 23 and 30 miles – but I also had shorter weekends where I focused on speed or hills rather than just loads of volume. Then about 5 weeks out from the South Downs Way 50 I got sick. It wasn’t hugely surprising as work had been really busy (in a good way) and I was just completely exhausted. Given the level of fatigue and the fact that I wake up before 6am for work every day, the chances of me recovering quickly were fairly slim. But I gave it my best shot, cutting right back on training, sleeping as much as I possibly could and eating pretty healthily. I also went on a course of antibiotics from about 10 days before the race. This meant I stood on the start line of the South Downs Way 50 wondering what the day held in store... Would I get to the top of the first hill and know that the only sensible option was a DNF? Or would I discover that a massive taper was the way to go? In a way it was good that Brett had decided not to race – at least I knew he’d be nearby with the car if I had to make a difficult but sensible call. I can be very stubborn but I’ve also been doing this endurance malarkey for long enough to know when my body is telling me it’s sick rather than just tired. Registration went smoothly and the sun even made a brief appearance as we stood on the start line. As with most ultras I’ve done it was a fairly low key start though the support as we headed off (straight uphill) was great. Everyone else was running so I started at a gently trot deciding that this was the way to test whether I was better or not. Brett was a few hundred metres up the hill and I passed him with a smile on my face – I was still running and was feeling pretty good. In fact I kept on running and surprised myself by running most of that first hill. I wondered whether I was going to pay for it later. But I also remembered some advice from Stuart Mills about running at a pace that feels good at the time rather than mentally constraining yourself with pacing strategies – you might achieve more than you’d thought you were capable of and surprise yourself. I felt comfortable and wasn’t pushing it too hard so I kept running. I’d recce-ed a bit of the course beforehand but most of it was unfamiliar – I was seeing this race as a recce for the 100. I was surprised by how hilly it was – where my usual playground in the North Downs has short sharp hills, the South Downs had big long drags several of which were quite runnable or at least required a run-walk strategy. The course was also fairly relentless requiring fairly consistent work throughout – it would be easy to go off the boil mentally and lose a lot of time but walking a mile long hill that should really be run / partially run. There were some decent descents too and I made a mental note that this would have been a good place to train for the Transalpine. My right knee started to feel tender towards the end of the day – it’s recovered fine but is something to bear in mind for when I’m running twice as far as it could be a definite weakness. Loads of people had told me about how exposed the South Downs Way is but I’d been pretty lucky on the few times I’d been there, especially a recce from Winchester to Petersfield a couple of months ago which may well have been the first day of Spring. Saturday’s weather wasn’t so kind and I think that was a really useful lesson for me for the 100. It was pretty warm down low but up on the top of the hills we were in the cloud and there was a cross-wind which made it really cold. I know this is nothing compared to the race conditions last year but I’d have really benefitted from a windproof top layer and will make sure I bring along something for the night portion of the 100. If it had been much colder I’d also have needed gloves. The cloud also made it quite disorientating – so much for beautiful views out to sea! The thing I enjoy about ultras is getting into the routine as the day progresses. I got into a good rhythm early on and found myself enjoying my own company. After a busy few months at work and home, it was great to be out in the hills with just my rucksack and my thoughts. I chatted to a few people but was generally quite content just making progress on my own. My mental strength throughout the race is one of things I’m most pleased with. I didn’t have a single negative moment which was a welcome difference from the RAT last summer. I don’t run with a watch but, when I reached the 27 mile checkpoint I asked for the time – 5 hours. I was quite surprised. Given I’d been ill for the last month, I’d set myself a target of 12 hours and, bar the wheels well and truly falling off, I was on target for smashing that. At the halfway point I started drinking coke which perked me up. The Centurion guys definitely stocked the checkpoints well – I even spotted homemade gluten free cake at one of them. My particular favourite were the ham wraps which made a nice change from the TORQ bars and Kelloggs Elevenses bars which I was eating the rest of the time. As per usual I didn’t hang around at the checkpoints. I carried enough food for the whole race and just used the checkpoints to refill my water bottles and grab a handful of food to give my taste buds some variety. At the next checkpoint I plugged myself into my MP3 player so that I could have a bit of a re-start for the final third of the race. What with that and the diluted coke in my water bottles I definitely found a bit of a second wind. That final third went really quickly, other than the final run through the streets of Eastbourne. I’m really glad I’ve practised that and know how far it is before the 100 – it definitely dragged on for longer than I’d have liked! But finally I did find myself arriving at the sports park for my finishing lap round the track. I was incredibly chuffed to come over the finish line in a time of 9:41 – I totally surprised myself and exceeded all my expectations. There’s definitely more work to do before 14 June but I’m feeling positive that I’m now fully recovered from my illness and ready for the next 8 weeks of training. It was great to feel the sun on my skin again last weekend. Admittedly there was still a lot of mud (thank goodness for mud claws!) And some serious flooding. But I just loved being out in the Surrey Hills again and feeling a hint of spring. It also helped that Brett was running again. He was out of action for a month before Christmas with a twisted ankle and has been ill since Christmas. So I've been doing most of my running on my own. I do enjoy having the time to myself to think but I get that for about 35 miles during the week. When I'm out exploring the hills at the weekend I prefer to have company - especially as the runs get longer and I've now started regularly pushing up over the 3 hour barrier again. My racing has actually already begun - with the first race in the G3 series. This was the first 10k I'd done in a very long time and it was a real lung and leg buster. Stupidly hilly and very muddy - but there was no way I was going to let myself walk on a 10k course! And that's been the point of entering - last year I think I did too much long slow stuff and it meant I could keep going but lost top end speed, got injured and it stopped being fun. So this winter I'm mixing it up a bit - the G3 series plus two road half marathons (Wokingham and Surrey). Then in April the ultra season starts.... The South Downs Way 50 at the beginning of April, the Malvern Hills ultra (54 miles) four weeks later and then the biggie in June - the South Downs Way 100. My first 100 miler - eek! This may seem like an odd time to do an end of season review given that I've still got several races to do before the end of the year. However, my season was meant to end with the RAT on 17th August. And so I thought it would be useful to explore why that ended up being my first (rather than last) race of the year. My number one learning is that I should have never ever ever thought I could keep up ultra training while moving house. Especially when that house move involved selling a flat, buying a house that needs a not insignificant amount of work, moving to an entirely new area, extending my commute by about 25 mins in each direction and meaning I no longer have the option of running from home to work. I massively underestimated the huge impact this would have in me. We did decide not to do any racing until after the move and our first race wasn't until 2 months after the move. But that was a 20 miler and with a 50k scheduled for a month after that and my first 100k a month later it definitely added an extra layer of stress that I didn't need. I've also learned some useful lessons about training for long single day events. Knowing that long training runs are key we scheduled a lot of these. So many that there were points when we were running around 30 miles every Saturday. During the heat wave I just don't think this was sensible - I took myself into some very dark places and don't think I helped myself psychologically as I didn't enjoy many of these sessions. I also had to dig so deep that I struggled to get good consistent sessions for the rest of the week. Next year I'll schedule a long run every 3-4 weeks rather than every weekend. And follow it with a rest week. Consistency has been the main issue for me this year. I've been ill quite a bit (mainly due to stress) and with time needed for admin related to the move this means I've never really got to the point where I'm in a consistent routine. I believe that this sort of consistency (e.g. 3-6 months of averaging 50-70 miles per week) is key to ultra running success. It also helps me to keep my weight down. My main objective for next year will be consistency. I definitely feel more settled now in terms of our new home and my commute. And I've had a rethink in terms of how I structure my week. I've recently realised that I can get off the train at Clapham Junction and do a 9 mile run to work through the parks and along the river. It's a nice route and that's important to me. My plan is to do it Tuesday, Wednesday, Thursday mornings. Then on Friday I'll work from home and have a rest day before the weekend which will include an hour of yoga. That's been a good learning from this year - I've bought some yoga DVDs and have been using them whenever I can. Being able to do an instructed yoga session at home and in my own time has made this much easier to fit in than going to a class. On that note, we're buying some gym equipment for our front room. I did quite a bit of leg work over the winter this year and aim to get to the gym at lunch time for 30 mins 2-3 times per week to do core exercises. This helps me to maintain my form over the longer distances and builds my small stabilising muscles (e.g. knees and ankles). By having some basic weights and a wobble board at home it'll be easy for us to do this together in the evenings. We're also looking at buying mountain bikes. This is something we always promised ourselves we'd do when we moved out of London. And we're both keen to start cycling again. It should be great cross-training, prevent us from doing massively high running mileage year round and will also be a good way of recce-ing running routes - for example the South Downs Way which we've entered as our "A race" for next year. One of the main reasons for picking this race is that it's close by and we'll be able to train on terrain that's the same as we'll be racing on. We both loved the transalpine run but will be hard-pressed to "race" any of the big mountain races as we just can't train on similar terrain where we live. While we'll definitely look to spend time abroad training, we realised this year that we both got enjoyment from being able to race the RAT and be competitive. Looking back over recent blog articles and entries in my training diary, I noticed quite how often I've been mentioning the problems with my right lower leg. So I thought I'd devote a whole article to talking about what's been going on and what I've been doing about it. It started on day 2 of our Isle of Wight run. Early on in the day, before I was properly warmed up, I suddenly experienced an intense muscular sensation in the top right of my right calf. It was totally different to any injury I'd had before. Looking back I'm 99% sure that the cause of the injury was a long steepish descent at the end of the first day. The hill also sloped off towards the sea so it was a really awkward camber to be running on. The lack of training in my legs probably meant I was too fatigued after 35 miles of running to stabilise my leg effectively on that downhill. Something I did on the Isle of Wight (and which I've done on long training sessions ever since) is put a Compressport calf guard onto the offending leg. I've worn these for recovery for years and swear by them. They're a great fit and seamless which means they don't rub / leave unsightly lines in my legs like other brands I've tried. I also find that compression gear massively speeds up my recovery - something pretty key with the amount of running I'm doing. I mentioned it previously in this article on the Transalpine. I've not tended to actually run in compression gear though. To be honest this is largely cos I overheat and so in the summer I don't want to cover up my legs, I'd rather feel the air on them keeping me cool! But this summer I've been sporting a fetching one-calf-guard-on-one-calf-guard-off look. I've not overheated and the calf guard has kept my offending right calf warm and supported. The other thing that's made a big difference while running is focusing on relaxing. I'm a big fan of the Chi Running technique and I see this as the main reason I've managed to up my training mileage so much and take on ultra marathons. When I completely relax my lower body (except my core obviously!) and remove absolutely any hint of tension from my right lower leg by just picking up my foot rather than pushing off with it then I get no pain at all. In terms of recovery, I've been using all my tried and trusted methods. I've been seeing Martin for regular sports massage, particularly focusing on my glutes and then the band down my right itb / quad and into my calf. Charles has been using acupuncture to get deeper into the muscles of my right glute and leg to release specific areas of tightness / muscle spasm. And I've been seeing Paddy for osteo treatment. I've got a twist in my pelvis which he straightens out. He's also been doing a lot of work on releasing tightness in my lower right leg - it looks like the location of the pain is where everything feeds into the top of the fibula and that this has become all gummed up. So Paddy's been manipulating my leg to get everything moving smoothly again. On more of a DIY front, I've been doing all the usual - stretching, loosening exercises for joints, rolling, glute trigger point release with a tennis ball and using hot wheat packs. Paddy's also given me an exercise where I lie on a couple of strategically placed books to realign my hips. The RAT was the first time I'd raced in the dark. And I've done very little running in the dark full stop. This made me a bit nervous going into the race but there wasn't a huge amount I could do about it given that the race was in August - training in the dark would have meant missing out on sleep and I decided that sleep (and so not risking getting sick) was more important. As a member of the Trail Running Team I was lucky enough to be given a LED Lenser head torch. And I'd had the chance to practise using it when we were out in the Alps in June. I was really pleased about this as it meant I knew what I could expect from the torch and that definitely gave me confidence. 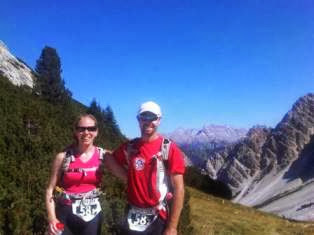 In the Alps, I had felt comfortable running up and down technical Alpine trails. And so I was fairly certain I'd be ok on the Cornish coastal footpath. I was more nervous about navigating in the dark. Whilst the race was on a well-marked long distance trail, my experience (e.g. Our trip to the Isle of Wight) has taught me that this doesn't always mean you can get away without knowing the route. We bought a map and spent the days before the race recce-ing the tricky bits - mainly when the route passed through villages. This wasn't the best option but it had to do as we couldn't head all the way to Cornwall twice and we couldn't run the whole 50k (it was a there-and-back route so that would be sufficient for recognising the whole 100k route) in the days running up to the race when we needed to be resting. So when I stood on the start line at midnight I felt pretty comfortable with what lay ahead. The LED Lenser head torch was really impressive. It lit up the path brilliantly and I felt I could run in pretty much the same way as during daylight. In reality, I probably wasn't quite as fast but that's not exactly a bad thing at the beginning of a 100k race! About 30 mins in I realised that the torch was a bit tight and was pressing on my head. But I was able to adjust the strap while it was on my head and I kept on moving while I did this. It was easy to change the direction of the beam (helpful on steep downhills or uphills) and its brightness. My one problem was my batteries running out. But this was my fault - I hadn't put in new batteries for the race and dawn was about 2 hours later than I'd expected. So the torch lasted 6 hours on not-new batteries - I don't reckon that's a bad statistic. And it had a helpful red warning light that flashed when the battery was low. Given it was almost light I didn't change my batteries. Once the batteries were low, the torch would switch itself off to preserve the battery that was left. I could see enough to run most of the time and I was then able to switch it back on for the bits where I needed a bit of extra light. And what about getting lost? There were a few parts where I went marginally off course or went round the perimeter of a field when I could have taken a direct route across the middle to the next stile / gate. In fact the only point where I got lost to the point that it bothered me was after dawn! In terms of running in the dark, I now feel much less scared about this aspect of longer races. In an ideal world I'd still want to recce the night time bit of the course in advance. But a section of night time running is definitely not something to put me off a race anymore.